Your mother will thank you for this. This recipe has all the same wonderful flavors as traditional Chicken Cordon Bleu without all the mess and hassle. It is layered and baked in the oven in easy casserole fashion. The sauce puts this recipe over the top. Whether you are making this for Mother's Day this year or simply giving this recipe to your mother as a gift, she will thank you from the bottom of her heart. Enjoy! Coat a 9 x 13 baking dish with non-stick cooking spray. In a medium bowl, combine the bread crumbs and 2 tablespoons melted butter; set aside. Lay all of the chicken breast halves in a single layer in the bottom of your baking dish. 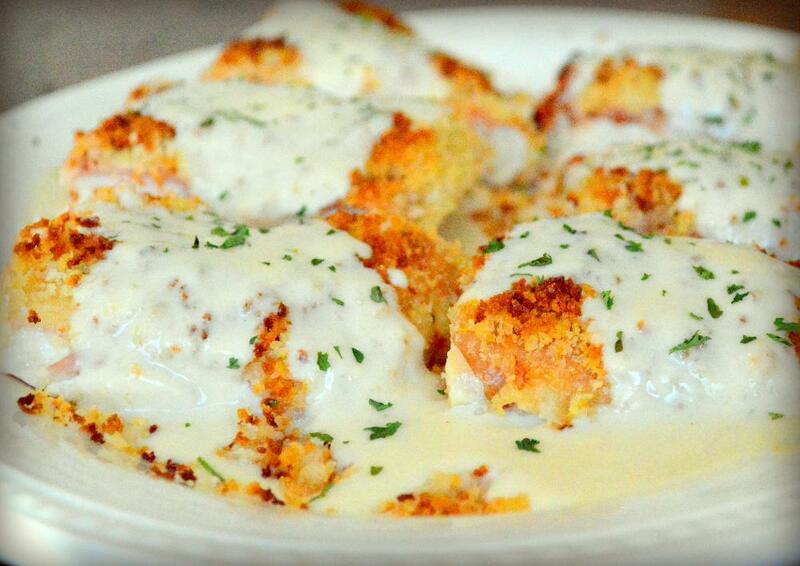 Unlike the traditional chicken cordon bleu recipe, there is no second layer of chicken in this dish. Next, layer your slices of ham on top of the chicken until chicken is completely covered. Then layer your slices of cheese on top of the ham. Sprinkle your bread crumb mixture over the top. Bake uncovered for 30 to 35 minutes, or until the chicken is cooked through (clear juices), the cheese is bubbly and the bread crumbs are golden brown. You may want to broil the chicken for a minute to really brown the bread crumbs. While the chicken bakes, melt butter in a medium sauce pan over medium heat. Whisk in the flour to form a roux, cook for 1 to 2 minutes. Slowly pour in the milk and chicken broth while whisking constantly, make sure there are no clumps. Whisk constantly until the mixture begins to thicken, about 5 to 7 minutes. Remove from heat and stir in mustard, Worcestershire sauce, and Parmesan cheese, until the cheese is melted. Season the sauce with salt and pepper. Keep the sauce warm. Remove chicken from oven and let it sit for 5 minutes. Cut into squares, plate, and top with sauce. Sprinkle with parsley, if desired.